Last year at the Nordic Barista Cup, a prototype of the Wilfa Svart Manuell was first unveiled and put in the hands of attendees. I posted what little I knew back then, but have since had the opportunity to try one out myself. 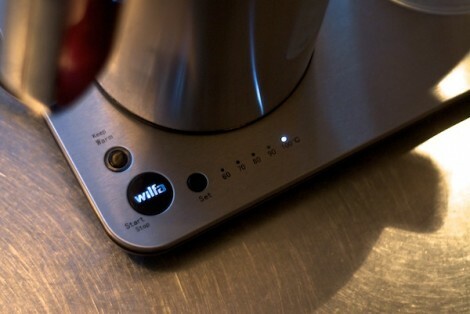 The all-in-one kettle and pour over device, which was developed with the help of Tim Wendelboe, has moved beyond the prototype stage and will be officially released in three weeks—on the 25th of April. The US market may see them in 2013, but until then there shouldn’t be trouble finding people to use them here in coffee loving Scandinavia. While I don’t consider myself the primary market for this, there are some things I really love about it, particularly the cohesiveness of all the parts. Everything fits nicely on the base which can be picked up and moved easily around the kitchen. 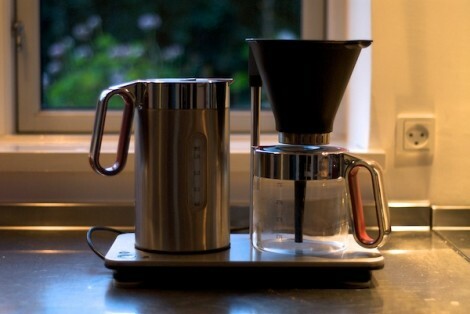 It includes everything you need to get started brewing pour over coffee, except a grinder—making it great for those who are brew-curious, or just want a hassle free coffee set-up for their parent’s home or their Nordic cabin in the woods. 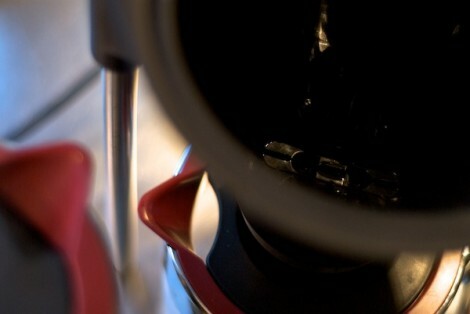 The cone uses standard Melitta filters and has complete flow control through the ring at the bottom. Which allows you to completely close it off for full immersion or fine tune the extraction time—adding a new variable other than grind size. The filter also sits in a removable cup that rests in the cone, making it easy to dispose of the used grounds. The cone is held stationary above the caraffe, which is great for stability, but lacks the ability to place a scale underneath it. In an attempt to keep things easy and approachable, it makes it less desirable to someone like myself who feels blind when brewing coffee without a scale—but that may be a personal problem. 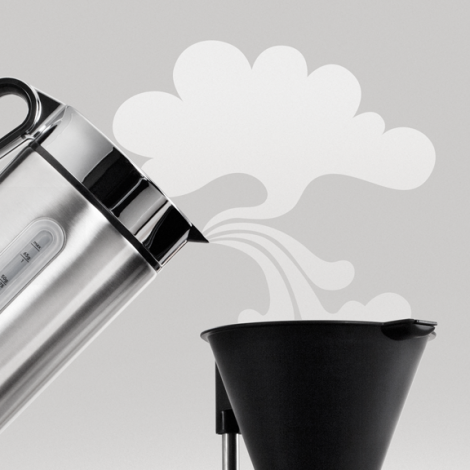 The kettle has a 1.2-liter capacity and heats up quick. It has variable temperature settings, making it great for brewing teas and the “keep warm” function will allow you to maintain the water temperature while rinsing filters. It doesn’t have the pour control of a thin-spout, but it’s better than most standard kettles I’ve used. The most exciting thing about this product is the effort given to manual brewing at home by a large home appliance company like Wilfa. Instead of just creating their own version of a V60, they’ve thought about the whole coffee making process and what may deter someone from brewing manually. 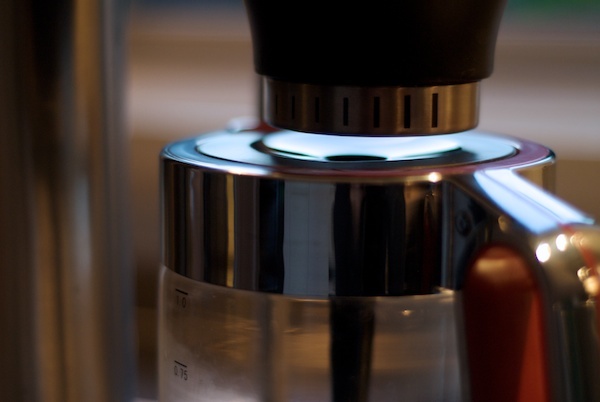 In a home appliance market flooded with k-cup machines, it’s nice to see manual brewing given this kind of attention. The production models don’t look like they’ve changed much from the prototype I used, other than the color (which is now a more elegant looking black) and some of the graphic details. I look forward to comparing the production model when I have the chance. You can watch Tim Wendelboe demo the Svart Manuell in the video below!